Yes, the girl-in-an-opulent-gown book cover has been majorly overdone for some time now. But aside from that bit of unoriginality, which I know the author generally has little if any control over, this was a fast and fun and not unoriginal read. Haven is a smart, quiet, driven high school student who lands a prestigious work-study position at the opulent Lexington Hotel in Chicago, along with her best friend Dante and their brilliant, shy-guy classmate Lance. The position seems too good to be true---which, of course, they find out not far into the book, it is. The ridiculously young and beautiful people running the Lexington (who call themselves "The Outfit") are in the business of collecting souls, working for the devil himself. And they hope to recruit Haven and her friends into their elite club. But Haven and Lance are harder to sway than The Outfit expected, and their hoped-for recruits fast become their most dangerous enemies. Aside from the pacing being a bit choppy in places and the unanswered questions that readers will just have to mull over until the next book comes out, this was an entertaining, diversionary book. I was in a reading slump, and Alysa brought this new YA mod-fantasy to my attention. In the early stages of the book, I was afraid Haven was going to cave to the pressure of the glamorous, hedonistic lifestyle she was surrounded by and then have to spend the rest of the book trying to overcome her early bad choices. It was refreshing instead to have a leading lady who stuck to her moral, goody-two-shoes guns. 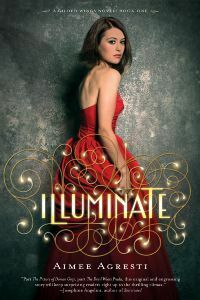 I definitely wouldn't have liked the book as much if it had been the typical teen-has-to-learn-the-hard-way, dark-and-a-little-scandalous sort of read. It was dark, but it wasn't scandalous. Pretty much squeaky clean, actually. Maybe that makes Haven unrealistic. I thought it made her likeable. In any case, if you're in a reading slump and are looking for a fun thriller to get lost in, this one gets my thumbs up.